More and more, execs at tech events need to single out bloggers as a distinct audience in addition to traditional press, media and IT analysts. Topics include social software, Lotus Connections, Bluehouse, etc. Mike Rhodin sits down with the bloggers soon after the Opening General Session at Lotusphere 2008 to cover a wide array of topics that each blogger got to ask on the fly with no questions known in advance by Mike in this second annual edition (to catch last year's visit IdoNotes Episode 26). Theme: evolution of collaboration, information is power, importance of sharing, social computing and need for control from an enterprise perspective, connecting to people, etc. Quickr and Connections introduced last year. Client: Rheinmetal ... company of many business units, operational independence of business units, built through M&A, public company, global company, need to collaborate across diverse infrastructure ... defense contractor, security very important, Quickr, Connections etc. 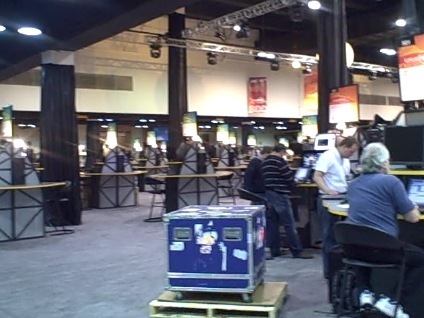 chosen (IBM over two other competitors). Content, collaboration and innovation as key factors. Client: Teach For America ... non-profit focuses on educational equality ... only 1 in 10 students in low income communities will graduate college ... national corps of recent college graduates and professionals ... corps members teach for 2 years in urban and rural areas ... 5000 corps members, 12,000 alumno, 425K student participants ... challenges: fast workforce turnover since workers retire in 2 years - most people are under 30 so knowledge loss and issues with exchanging experiences ... need to have a set of tools attractive for members ... blogs, wikis, etc. Inefficient ad-hoc collaboration, expertise location, etc. Tried open source - settled on IBM platform. Benefits include access to learning sources, collective knowledge, access to experts, community-building. Client: Colgate-Palmolive ... 36000 employees, worldwide ... need to leverage processes, ideas, best practices to leverage productivity - strong internal culture - very consistent IT - performance and reliability are key when selecting technology ... matrixed organization - operational efficiencies are strong factors that influence efforts ... pilot underway for Quickr and Connections ... believe they now need to be an early adopter. Design partner for IBM. Connections pilot starting with Profiles in 2008 and expanding into other Connections components into 2009. Benefits: decentralized innovation, increase speed to market, improved sharing - talent management. Why Is Social Software So Important? Recognizing the critical role informal networks and relationships have on organizational success is necessary to understanding the importance of social software. In many ways, business strategists are entering an age of Copernican enlightenment regarding the need to transform industrial-age management practices and the manner in which the organization communicates, shares information and collaborate; both internally and externally. Accomplishing this feat will require a combination of tactics, not just technology. However, social software is considered a complimentary component for delivering applications that engender greater levels of contributions from stakeholders that have been disenfranchised by outdated human capital management tactics. Catalyzing stakeholder participation builds relationships that evolve into a groundswell of community action. Leveraging community involvement can provide unique and valuable solutions that address business imperatives related to innovation, growth and strategic talent initiatives. In a June 2004, Tim O’Reilly coined the term “architecture of participation”(AoP) to describe systems designed for user contributions. The term is very relevant concerning social software and way IT strategists have traditionally designed, built and deployed enterprise applications. Understanding where social software is heading cannot be fully appreciated unless strategists comprehend the historical context of why applications were constructed a certain way. The phrase “form follows function” is an architectural and design principal that is also very applicable to the software industy. In essence, developers built applications (representing “form”) in response to business requirements (representing “function”). In many organizations, business requirements for IT systems focus on functional automation of work (e.g., data collection, document processing, and workflow management). Adhering to a form-follows-function approach to system design, IT organizations have delivered applications that automate the transactional, informational, and analytic needs of those work functions. Even collaboration and content management applications frequently support the functional needs of a given work scenario. For example, a project workspace created to support a marketing team working on a proposal is not intended to be the primary vehicle for capturing competitive intelligence. A competitive intelligence workspace may not exist, and even if it did, the marketing proposal team might not be authorized to contribute to it. If permission was obtained, information placed within the competitive intelligence workspace may have access controls that prevent search engines from indexing the information and making it easier to leverage by others in the enterprise. While this example is over-simplified, it illustrates a common situation where worker contributions can be constrained by applications designed to support formal and structured work tasks. As an application construction mantra, “form follows function” still makes sense under certain circumstances, but building social application requires a different construction paradigm. Systems designed to support functional requirements do provide ways for workers to contribute, however the contributions are part of their explicit work actions and generally known ahead of time. Such systems cannot effectively support contribution scenarios not captured as part of the design process. Those involved in the application design process often place little effort on requirements that address the social and emergent aspects of communication, information sharing and collaboration. Workers resort to e-mail to solve such contribution gaps – a key reason why e-mail remains the most popular tool used by workers to express themselves. E-mail is one of the few universal tools workers have access to that allows contributions in a free-form manner. 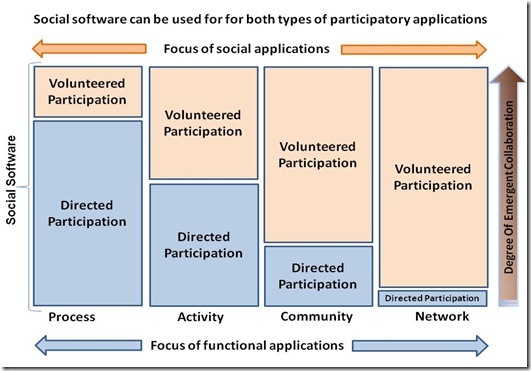 Understanding where social software is heading cannot be fully appreciated unless strategists pragmatically acknowledge the link between the applications, participation, and user contributions. A quote by Marshall McLuhan, "we shape our tools and thereafter our tools shape us," represents an important concept to acknowledge when exploring how social software facilitates participation and user contributions. If one agrees with the premise that the form-follows-function approach to application construction has inadvertently created an environment with noticeable participation and contribution gaps, then one should also believe that those tools consequently shape the perception of users and the organization at-large that participation and user contributions are not valued. Clearly, the problem is not that simple and not completely resolved by adding feature to those functional applications. A variety of factors influences the reasons individuals participate and contribute beyond what the job demanded from them. This is frequently the case with workers in transactional environments (e.g., call centers, claim processing, and retail point-of-sale) where management emphasizes time/labor productivity other measures often associated with throughput metrics. However it should be noted that transactional-centric workers are in a position to contribute valuable insight if provided with the right circumstances. Information and knowledge-centric work environments (e.g., sales, marketing and product research and development) typically affords workers greater opportunities to contribute beyond the explicit nature of the job role, duty and tasks. Here, management is more receptive to workers taking the time to capture and share their know-how through use of various content management and collaboration systems. Indeed, deploying such systems for information and knowledge workers has been common practice within organizations for many years. The benefits gained from galvanizing the creativity and know-how of people is not a revolutionary concept. Knowledge management strategies over the past decade have long sought to improve communication, information sharing, and collaboration across information and knowledge workers. Community-building initiatives over same time period have also long sought to create feedback-loops from external audiences (e.g., employees, customers, business partners) that lead to improved brand affinity, product capabilities and service delivery from such insight. Yet many organizations have not been able to capitalize on such investments at an enterprise-level, especially those related to knowledge management. When strategists are successful, it frequently occurs when the focus is on improving information sharing and collaboration within specific work functions. Task-centric productivity solutions generally experience less blocking factors (e.g., cultural, political, worker skepticism) than those encountered during KM efforts. Often, the level of participation and user contributions related to task-centric work is directed by management oversight, the role expectations of those involved and the nature of the task itself. While information sharing and collaboration efforts might appear to be successful on many fronts, it does reinforce the premise that more qualitative levels of participation and user contributions are not being realized. While strategists dismiss KM they also paradoxically lament the need for improving knowledge sharing. This gap is largely due to organizational factors but the limits of form-follows-function applications play a role in reinforcing cultural messages that social interaction, relationship-building and knowledge sharing are not valued. There is a paradoxical nature to participation that should be recognized when discussed in the context of social software. It is obvious that after decades of people using content management and collaboration systems there is ample evidence that people participate and contribute through these tools and the applications constructed using these tools. Yet the exuberance associated with social software, often under the guise of Web 2.0 and Enterprise 2.0, is driven by the argument that only certain tools (e.g., blogs, wikis, tags/bookmarks, social network sites) support the “architecture of participation” concept put forth by Tim O’Reilly. If people already have tools at their disposal to participate and contribute, why do they need different tools to participate and contribute? It seems contradictory on many levels. Process: A process is a structured collection of tasks that are often sequences in a particular way with workers interacting based on their respective roles and duties within that collection of tasks. Activities: An activity is a collection of semi-structured tasks that are not rigidly sequenced but are often co-dependent and completed within a certain time period. Communities: A community is a relationship-based group structure (as opposed to a task-based structure) that forms around a shared interest area (e.g., anyone who is interested in improving customer service) or a shared practice (e.g., all nurses who want to improve patient care). Networks: A network is a social structure comprised of people that have some inter-connecting bond based on a variety of factors (e.g., personal friendship, similar values, shared relationships, common educational or work experience). Social networks are rarely driven by tasks or activities per se. However, people reach out to their network contacts frequently in response to a process, activity or community event. Most contributions within business processes are governed by formal managerial practices and supported by applications that are structured in terms of workflow, roles and task sequencing. Activities are slightly different. While they are still structured and formal in many ways, they are driven to complete a deliverable within a certain time-period (e.g., a project). Joint work dependencies do indeed solicit participation and contribution from those that have a vested interest in the activity but the majority of the participation and contributions remain directed towards the outcome of the activity (e.g., a document or a presentation). The first example where voluntary participation outweighs directed participation occurs with community-related exchanges. Most people are not conscripted into a community but join of their own choice. The level of their interaction is very much something that they decide themselves. An example where participation is very rarely directed are social networks. Networks are almost always informal and based on voluntary relationships. People often participate and contribute to their social networks because they are emotionally satisfied at some level by being involved and contributing. It’s not the case that organizations perceive that they need social software to dramatically improve the quantity and quality of participation that is directed. The real objective is to catalyze voluntary participation and contributions across all work categories to improve communication, information sharing and collaboration. 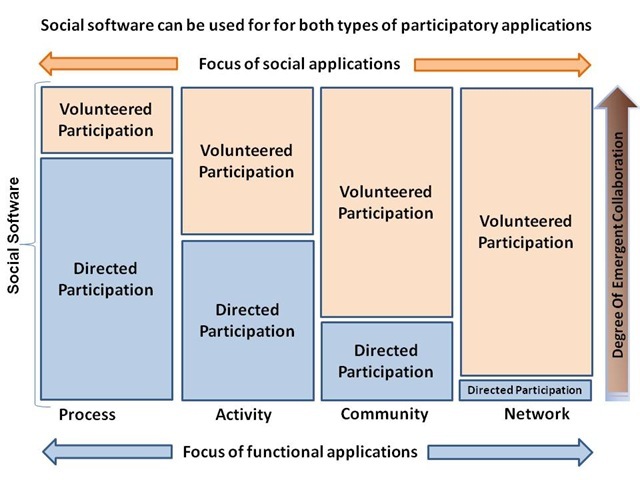 Many different social software tools can be used to support functional applications that direct some level of participation and user contributions. What excites strategist are social applications that catalyze volunteered participation and user contributions – a long-standing objective of knowledge management and human capital management strategies for decades. What needs to occur to change social sharing? Note: this assumes a certain corporate culture - IBM may have the type of environment where this level of trust and sharing is welcome - not all organizations are necessarily that friendly. You simply cannot make an global assumption that defacto internal sharing is better in some way than external. You can say that it is different - but not better/worse than sharing on external sites. Interesting: can take lists data (top 5 technologies you cannot live without) and convert it into a tag cloud and you can get a sense of what tools are really valuable - you can drill down and poll / ask people to get a deeper understanding of why that tool is so important. Events. Hackday - people hacking new/different apps. People not in the community can peer into the event, who was involved, conversations, etc. User Profile: automated maintenance of what is being shared and filled out with recent information. Beehive lets people connect at a personal level (not the same as Connections). But, you need to do so in a way that fits the enterprise - security, compliance, etc. Composite applications - (portal UI re-packaged) - mashups as a productivity accelerator. Setting up the argument for Symphony (money diverted into Office, etc). SAP news: "Atlantic" ... first joint software product between the two - access SAP information from Lotus desktop. 4Q08. 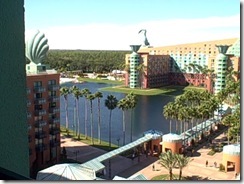 Leave, travel expense processing from Lotus Notes. Workflow. 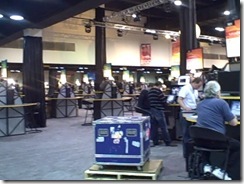 Demo: Atlantic plug-in brings SAP data into Notes. Demo: Sametime Unyte called out. Google gadget integration, widgets can be shared via a catalog or email. Widgets can live in sidebar. Policies to manage widget distribution. I wonder if there is any security check on widgets as they are e-mailed around or before they are posted into a catalog. Widgets can be the front-end to a web service. DWA "light mode" - demo of Apple integration. Demo: Designer improvements, new design elements, etc. Built on Eclipse so other plug-ins can be supported. Lotus Symphony, 400K downloads, performance improvements, language versions and UI improvements based on community feedback. Developer capabilities coming in next beta. Demo: Atlas - examines interaction patterns - visually maps out network structure - expert demo - can view "connectedness" and best way to reach that person - best path to contact someone. Mashups: IBM Lotus Mashups: lightweight environment - graphical, browser-based tool designed to be used by business users. Mashup catalog. Ratings. Tagging. Commentary. Based on standards (but not defined what standards are being used) - can deliver them in Notes, WebSphere, other sites. Demo: Drag and drops of feeds (interesting angle to take on the demo since IBM has no underlying feed syndication platform). Can wire widgets together but no info on how wired - what "standard" is there for wiring widgets?). "Bluehouse" - project to serve companies with less than 500 employees - will extend/compliment Foundations - sharing contacts, projects, files, etc - SaaS play. Marketplace for SMB. Partners can participate and integrate. Software and SaaS = Foundations + "Bluehouse"
Well, the conference reception is winding down (man, it's cold here - warmer than CT but not what I expected) and I've settled down to watch the Packers and Giants (hoping for a Green Bay victory but the game looks like a toss-up - right now it's 17-13 Packers but the Giants are driving late in the 3rd Quarter (Green Bay just challenged a call but I think it was a catch). I was one of the judges for this year's Best in Showcase which got me onto the exhibit floor before everything was setup.